It's new! It's different! And it's fun! What is it? It's the 2nd annual L-burg '127' Ace Race disc golf event. It's not your tradional disc golf tournament. This will be a 27 hole challenge for a disc-golfer's short shot game. All holes will be set-up at a distance of 127 feet. Players get only one shot per hole. Everyone will receive 2 new proto-type discs which they are required to use to play. The players pack that participants receive will have a value at least twice the value of their entry fee. What is an Ace Race Event? 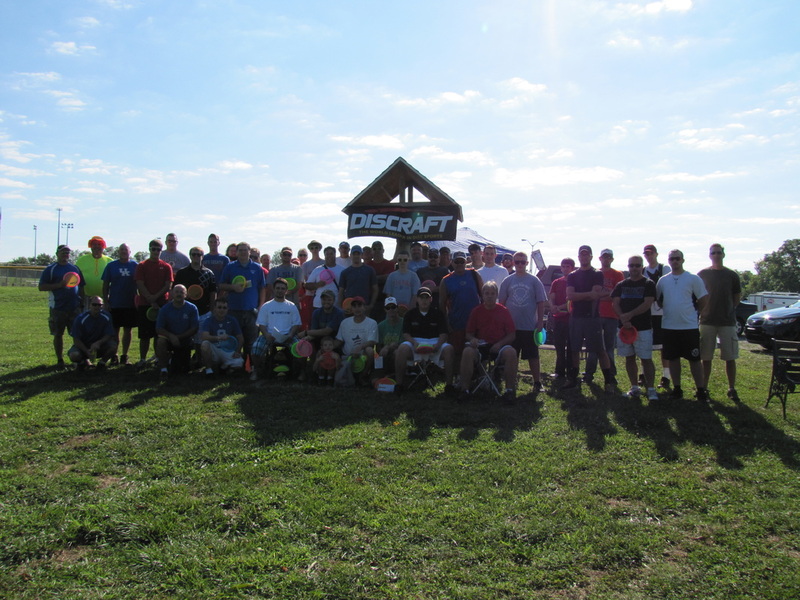 Each Autumn, disc golfers from around the country gather at their local courses for one purpose: to throw aces! No putting, no approaching... just runnin' at the chains. 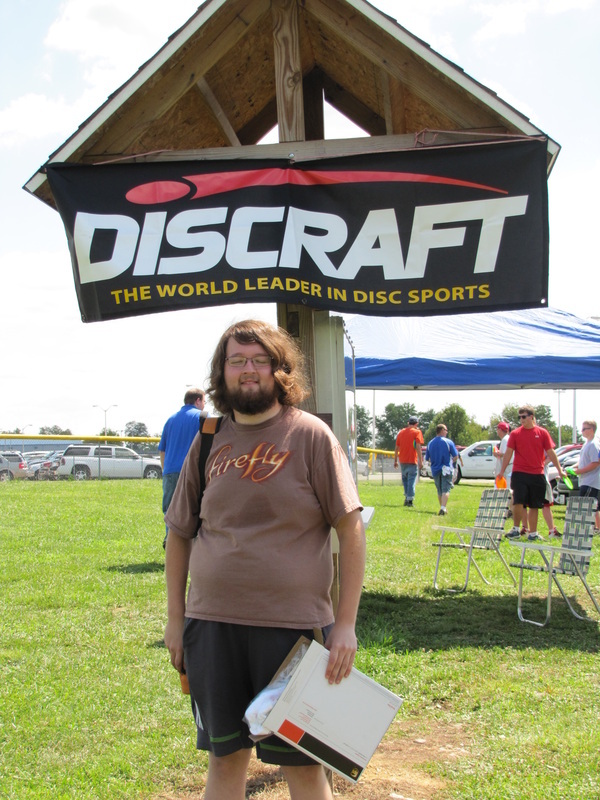 To add to the challenge and excitement, players all throw the same model disc: a brand new, never-seen-before Discraft prototype disc that is introduced each year especially for the Ace Race. All 2013 participants will receive a player's pack that included two discs, a mini, 2 pint size hard plastic cups, re-useable scorecards and sticker (2013 players pack pictured below). A value over 50 bucks, all for only $25! What are the rules of play for an Ace Race event ? Players are required to use the discs provided in their players pack, and only those discs. If a disc is lost, the player has the option of using the second disc from the package. Only one throw per player per hole. All players should have their own scorecards and mark "A" for aces (a hole-in-one) and "M" for holes on which they hit metal. After all players in the group have thrown, discs are picked up and the group moves directly to the next tee. Players keep their scorecards for each round of 9 holes, with each round recorded on a separate line on the scorecard. The player with the most aces after 27 holes is declared the winner. In case of ties, the number of metal hits is used as a tie breaker. If a tie persists, a closest to the pin contest is then used to determine the event winner. Are there different divisions or age restrictions? There are no divisions in an Ace Race because everyone competes with all other entrants. Young or old, male or female, everyone is welcome to participate in the Ace Race. All players (age 18 or older) must sign a waiver/registration form to participate. Participants under age 18 must have a parent/guardian sign the waiver. Blank waivers will be available at the Ace Race sign-in or a copy of the waiver can be printed, signed and brought to the Ace Race on August 18. Click here for the waiver. 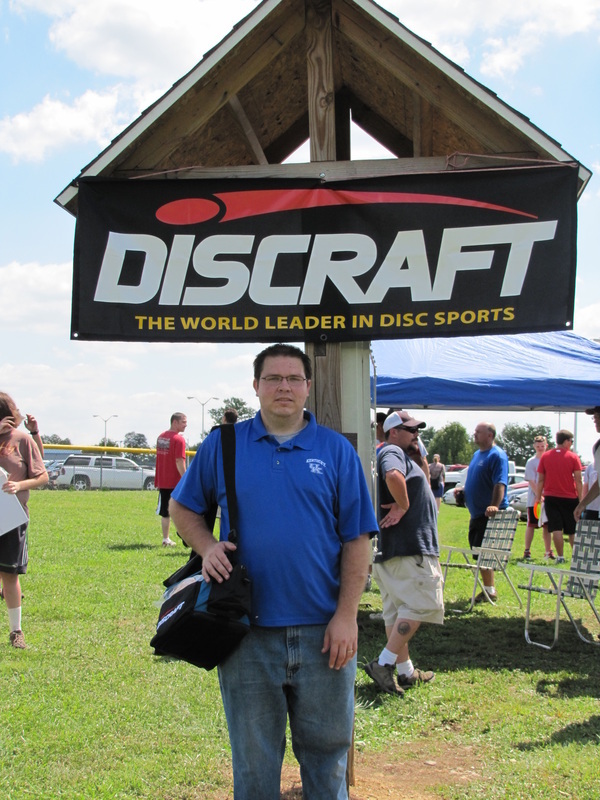 At this time, Discraft has not announced what the winner's prize package will be, but winners of Ace Races in 2012 received a grand-prize Discraft merchandise package, including a bag and eight new discs. 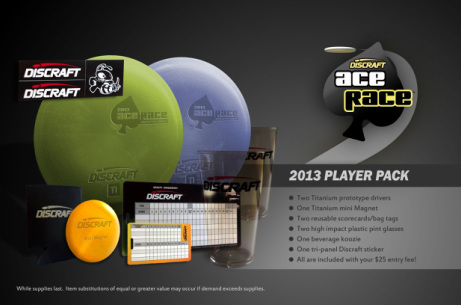 As soon as Discraft releases what the winner's prize will be for 2013 Ace Races, it will be listed here so check back later. What will the format be for the L-burg '127' Ace Race? The L-burg '127' Ace Race II will consist of 27 holes (3 different tee areas for each of the 9 baskets) making this an event of basically 1 round of 27 holes (get it? It will be a 1 - 27 hole event). Each tee area for all 27 holes will be marked with marker flags. Players will play all 3 tee areas of a basket and after all players in the group have played the group will move on to the next basket. All tees will be marked 127 feet from the basket. Some may be uphill, some downhill, some flat, some obstructed but all will be 127 feet from the basket. Players get 1 throw per hole. If an ace is thrown then the player records an "A" for that hole on the scorecard. If the player does not get an ace but does hit some part of the basket (the pole, basket, chains, or yellow band), the player records an "M" for that hole on the scorecard. If nothing is hit on the throw then nothing is recorded on the scorecard for that hole. Mulligans are optional and may be purchased at the time of sign-in. A player may purchase a maximum of 9 mulligans. Mulligans will be available for purchase in groups of 3 for $5. Mulligans may be used at any time but only 1 mulligan per hole is allowed and must be thrown with the players 2nd Ace Race disc. If a player elects to throw a mulligan, he or she will record the better of the 2 throws on their scorecard. 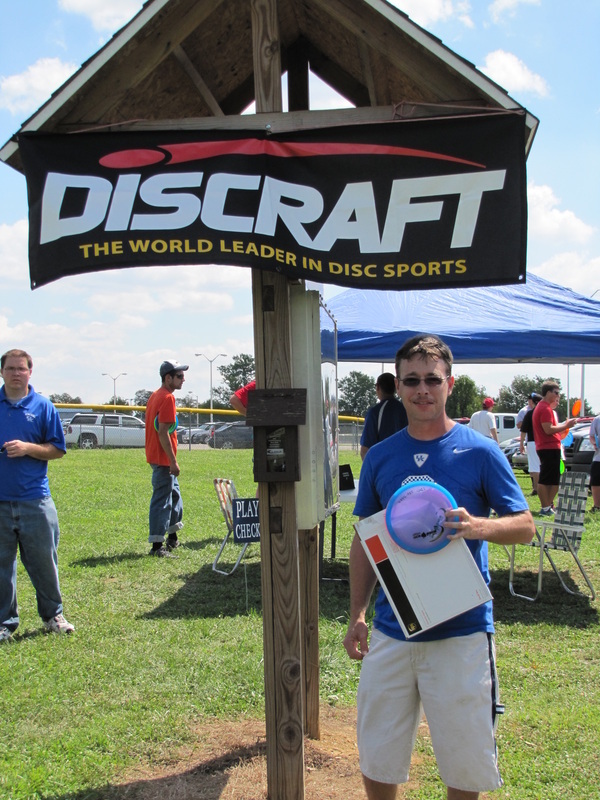 Because everyone will be playing using discs supplied in the player's pack, all participants must be pre-registered and pre-paid by the deadline date of August 1, 2013. That will allow time for the tournament director to order the correct number of play packs and have them ready for the L-burg '127' Ace Race II. The entry fee will be $25. There are no separate divisions, everyone is competing against everyone else. Remember, all throws will be from 127 feet. 9:00 - 10:00 Player sign-in and waiver signing at the Anderson County Community Park DGC. Distribution of player packs will be during sign-in. 10:00 Brief players meeting followed by a shotgun start of the Ace Race. Everyone is in the same division. Entry fee is $25. Each hole of the 9-hole Anderson County Community Park Disc Golf course will have 3 designated tee areas marked, each being 127 feet from the basket. A total of 27 holes will be played. A shotgun start format will be in place. Once play starts it will be continuous until everyone has played all 27 holes. Registration will be cut-off when the tournament field reaches 72 players (or August 1, when players packs will be ordered). Player packs will be given out at the player's meeting just prior to the start of the Ace Race. Players must be pre-registered and pre-paid in order to receive a players pack.